The Turks and Caicos Islands are a British Overseas Territory consisting of two groups of tropical islands in the West Indies. 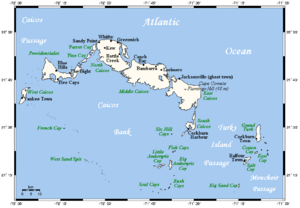 The Caicos Islands, separated from the closest Bahaman islands by the Caicos Passage, are the larger group, with almost 96 percent of the land area and 82 percent of the population. For many years, the Bahamas and Bermuda fought for control of the archipelago that was once a pirate hideout. The primary natural resources are spiny lobster, conch, and other shellfish. Salt was also raked from the sea. Located 575 miles southeast of Miami, the Turks and Caicos Islands has the third largest coral reef system and some of the best tropical beaches in the world, making it a premier beach, diving and snorkeling destination. But it remained largely unknown until the 1980s, when a surge of development began. The two island groups are in the North Atlantic Ocean, southeast of the Bahamas and north of Hispaniola. Though geographically contiguous to the Bahamas, the territory is politically a separate entity. The United Nations Committee on Decolonization includes the Turks and Caicos Islands on the list of Non-Self-Governing Territories. The eight main islands and more than twenty smaller islands have a total land area of 616.3 sq km (638 sq mi), primarily of low, flat limestone with extensive marshes and mangrove swamps and 370 km (230 miles) of beach front. The weather is usually sunny and relatively dry but suffers frequent hurricanes. The islands have limited natural fresh water resources; private cisterns collect rainwater for drinking. 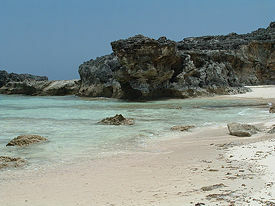 The Caicos Islands make up four of the six districts of the territory. Together with nearby islands, all on Turks Bank, those two main islands form the two of the six administrative districts of the territory that fall within the Turks Islands. Turks Bank has a total area of about 450 km². Twenty-five km (16 mi) east of the Turks Islands and separated from them by Mouchoir Passage is Mouchoir Bank. Although it is submerged with a least depth of 1.8 m (6 ft} and has no emergent cays or islets, it is part of the Turks and Caicos Islands and falls within its EEZ. Mouchoir Bank measures about 600 km² in area. Two banks farther east, Silver Bank and Navidad Bank, are geographically a continuation but belong politically to the Dominican Republic. The islands of the Turks and Caicos were first populated by Taino indigenous peoples, but, shortly after the islands' discovery — depending on the source, on October 12, 1492, by Christopher Columbus, who would have claimed them for Spain, or by Juan Ponce de León in 1512 — Spanish explorers began raiding the archipelago for slaves. Though many nations controlled the islands, official settlement did not occur right away. For several decades around the turn of the eighteenth century they became popular pirate hideouts. 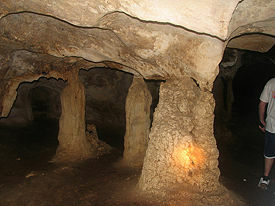 Bermudian salt collectors were the first to settle the Turk Islands in 1678 or 1681. In 1764–1783 they were under French occupation. After the American Revolutionary War (1775–1783) many loyalists fled to British Caribbean colonies, including (in 1783) the first settlers on the Caicos Islands; cotton became an important crop briefly. In 1799 both island groups were annexed by Britain as part of the Bahamas. There was a great deal of political turmoil surrounding the ownership of the Turks and Caicos even within the British Empire: Bermuda had been in effective possession of them for a century, though, under British law they were the common wealth of all British citizens. Spanish and French forces seized the Turks in 1706, but Bermudian forces expelled them four years later in what was probably Bermuda's only independent military operation. For many years, the Bahamas (itself originally settled by Bermudian puritans in 1647) and Bermuda fought for control of the archipelago. The struggle began in 1766, when the king's representative in the Bahamas, Mr. Symmer, on his own authority, wrote a constitution that legislated for and taxed the Bermudians on the Turks. The Secretary of State, Lord Hillsborough, for the Crown, issued orders that the Bermudian activities on the Turks should not be obstructed or restrained in any way. As a result of this order, Symmer's constitution was dissolved. The Bermudians on the Turks appointed commissioners to govern themselves, with the assent of the king's local agent. They drew up regulations for good government, but the Bahamian governor drew up his own regulations for the Turks and ordered that no one might work at salt raking who had not signed assent to his regulations. Following this, a raker was arrested and the salt pans were seized and divided by force. The Bahamas government attempted to appoint judicial authorities for the Turks in 1768, but these were refused by the Bermudians. In 1773 the Bahamian government passed an act attempting to tax the salt produced in the Turks, but the Bermudians refused to pay it. In 1774, the Bahamians passed another, similar act, and this they submitted for the Crown's assent. The Crown passed this act on to the Bermudian government, which objected to it, and which rejected Bahamian jurisdiction over the Turks. The Crown, as a consequence, refused assent of the Act as applied to include the Turks, and, in the form in which it finally passed, the Bahamas, but not the Turks, were included. The Bermudians on the Turks continued to be governed under their own regulations, with the assent of the royal agent, until 1780, when a more formal version of those regulations was submitted for the assent of the Crown, which was given. Those regulations, issued as a royal order, stated that all British subjects had the right ("free liberty") to rake and gather salt on the Turks, providing that they conformed to the regulations, which expressly rejected Bahamian jurisdiction over the Turks. Despite this refutation by a higher authority of their right to impinge upon Bermudian activities on the Turks, the Bahamian government continued to harass the Bermudians (unsurprisingly, given the lucrativeness of the Turks salt trade). Although the salt industry on the Turks had largely been a Bermudian preserve, it had been seen throughout the seventeenth century as the right of all British subjects to rake there, and small numbers of Bahamians had been involved. In 1783, the French landed a force on Grand Turk, which a British force of 100 men, under then-Captain Horatio Nelson, had been unable to dislodge, but which was soon withdrawn. Following this, the Bahamians were slow to return to the Turks, while the Bermudians quickly resumed salt production, sending sixty to seventy-five ships to the Turks each year, during the six months that salt could be raked. Nearly a thousand Bermudians spent part of the year on the Turks engaged in salt production, and the industry became more productive. The Bahamas, meanwhile, was incurring considerable expense in absorbing loyalist refugees from the now-independent American colonies and returned to the idea of taxing Turks salt for the needed funds. The Bahamian government ordered that all ships bound for the Turk Islands obtain a license at Nassau first. The Bermudians refused to do this. Following this, Bahamian authorities seized the Bermuda sloops Friendship and Fanny in 1786. Shortly after, three Bermudian vessels were seized at Grand Caicos, with $35,000 worth of goods salvaged from a French ship. French privateers were becoming a menace to Bermudian operations in the area at the time, but the Bahamians were their primary concern. The Bahamian government re-introduced a tax on salt from the Turks, annexed them to the Bahamas, and created a seat in the Bahamian parliament to represent them. The Bermudians refused these efforts also, but the continual pressure from the Bahamaians had an effect on the salt industry. In 1806, the Bermudian customs authorities went some way toward acknowledging the Bahamian annexation when it ceased to allow free exchange between the Turks and Bermuda (this affected many enslaved Bermudians, who, like the free ones, had occupied the Turks only seasonally, returning to their homes in Bermuda after the year's raking had finished). That same year, French privateers attacked the Turks, burning ships and absconding with a large sloop. The Bahamians refused to help, and the Admiralty in Jamaica claimed the Turks were beyond its jurisdiction. Two hurricanes, the first in August 1813, the second in October 1815, destroyed more than 200 buildings and significant salt stores, and sank many vessels. By 1815, the United States, the primary client for Turks salt, had been at war with Britain (and hence Bermuda) for three years and had established other sources of salt. With the destruction wrought by the storm, and the loss of market, many Bermudians abandoned the Turks, and those remaining were so distraught that they welcomed the visit of the Bahamian governor in 1819. The British government eventually assigned political control to the Bahamas, which the Turks and Caicos remained a part of until the 1840s. In 1848 they were declared a separate colony under a Council President. The last incumbent was maintained in 1873 when the islands were made part of the Jamaica colony; in 1894 the chief colonial official was restyled commissioner. On July 4. 1959, they were again a separate colony (Turks and Caicos), the last commissioner being restyled administrator, but until May 31, 1962 they were one of the constitutive parts of the Federation of the West Indies. By 1973 they had gained independence and their own governor. They have had their own government, headed by a chief minister, since August 1976. In 1979 independence was agreed upon in principle for 1982, but a change in government caused a policy reversal. Their political troubles in recent years have resulted in a rewritten constitution. Grand Turk is the administrative and political capital of the Turks and Caicos Islands and Cockburn Town has been the seat of government since 1766. The islands were under Jamaican jurisdiction until 1962, when they assumed the status of a British crown colony. The governor of the Bahamas oversaw affairs from 1965 to 1973. With Bahamian independence, the islands received a separate governor in 1973. Although independence was agreed upon for 1982, the policy was reversed and the islands are presently a British overseas territory. The islands adopted a constitution on August 30, 1976, which is Constitution Day, the national holiday. The constitution was suspended in 1986, but restored and revised March 5, 1988. The territory's legal system is based on English common law, with a small number of laws adopted from Jamaica and the Bahamas. Suffrage is universal for those over 18 years of age. English is the official language. The unicameral Legislative Council consists of 19 seats, 13 popularly elected; members serve four-year terms. Elections were held March 4, 1999, and again in 2003. The Progressive National Party, led by Hon. Michael Misick, holds eight seats, and the People's Democratic Movement, led by Derek H. Taylor, holds five seats. The United Democratic Party, led by Wendal Swann, received a small fraction of the popular vote but not enough to earn a seat. A great many of the tourists who visit the islands are Canadian. Owing to this, the islands' status as a British colony, as well as historic trade links, some politicians in Canada and the Turks and Caicos have suggested some form of union between Canada (a Commonwealth realm), as they already share the British monarch as head of state. In 1917, the prime minister of Canada first suggested that Canada annex Turks and Caicos Islands. In 1974, a Canadian Member of Parliament introduced a failed attempt at consolidating the islands. The idea was brought up again in 1986 but was rejected. For the islands to join Canada as a full province would require amending the Canadian constitution, unlikely because it could provoke provinces to reopen debate on other aspects of Canada's constitution. On the other hand, small changes to the constitution, such as renaming Newfoundland as Newfoundland and Labrador, have passed intact since 1949. The last new province, Newfoundland and Labrador, was brought into the country in 1949 by an act of the British Parliament. Joining as a territory would be easier, as territories can be created by an act of federal law. In addition, its population of 21,746 (est. 2007) people is considered insufficient for provincial status. However, this attitude might change should the territories of Yukon or Nunavut, with about 30,000 people each, ever become provinces. In 2004, the province of Nova Scotia voted to invite Turks and Caicos to join the province, should the islands ever become part of Canada. This would bypass the problems with admitting Turks and Caicos as a separate province. Eight of the thirty islands in the territory are inhabited, with a total population in mid-2006 of about 32,000. One-third of the population is under 15 years old, and only 4 percent are 65 or older. In 2000 the population was growing at a rate of 3.55 percent per year, with 14.46 migrants per 1,000 population and 25.65 births per 1,000 population, offset by 4.57 deaths per 1,000 population. The infant mortality rate was 18.66 deaths per 1,000 live births and the life expectancy at birth was 73.28 years (71.15 years for males, 75.51 years for females). The total fertility rate was 3.25 children born per woman. The annual population growth rate is 2.82 percent. Ethnically, the vast majority of inhabitants are black, or mixed race, and Protestant. Two-fifths are Baptist, one-fifth Methodist, one-fifth Anglican, and less than 2 percent Seventh-day Adventist. 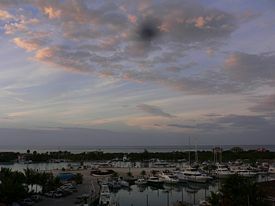 The economy of the Turks and Caicos Islands is based on tourism, fishing, and offshore financial services. Most capital goods and food for domestic consumption are imported. The United States was the leading source of tourists in 1996, accounting for more than half of the 87,000 visitors; another major source of tourists is Canada. Tourist arrivals had risen to approximately 200,000 in 2006. Apparently the government is pursuing a two-prong strategy to get money from tourists. Upscale resorts are aimed at the wealthy, while a large new cruise ship port and recreation center has been built for the masses visiting Grand Turk. The unemployment rate is about 10 percent. The territory takes in revenues of $47 million against expenditures of $33.6 million and receives economic aid, $5.7 million in 1995. The territory's currency is the United States dollar, with a few government fines (such as airport infractions) being payable in British Pounds. The primary agricultural products include limited amounts of maize, beans, cassava (tapioca) and citrus fruits. Fish and conch are the only significant export, with some $169.2 million of lobster, dried and fresh conch, and conch shells exported in 2000, primarily to the United States and the United Kingdom. In recent years, however, the catch has been declining. The territory used to be an important trans-shipment point for South American narcotics destined for the United States, but due to the ongoing pressure of a combined American, Bahamian, and Turks and Caicos effort this trade has been greatly reduced. The islands import food and beverages, tobacco, clothing, manufactures, and construction materials, primarily from the United States and the United Kingdom. Imports totaled $175.6 million in 2000. The islands have no significant railways and 121 kilometers of highway, 24 km paved and 97 km unpaved. The territory's main international ports and harbors are on Grand Turk and Providenciales. The islands have seven airports, located on each of the inhabited islands. Five have paved runways and two have unpaved runways. Providenciales International Airport is the main entry point for the Turks and Caicos Islands. ↑ "UK imposes Turks and Caicos rule", BBC News, 14 August 2009. Retrieved January 17, 2012. ↑ Damien McElroy, Turks and Caicos: Britain suspends government in overseas territory The Daily Telegraph (14 August 2009). Retrieved January 17, 2012. ↑ IFES Election Guide - Country Profile: Turks and Caicos Islands. Election Guide. Retrieved January 17, 2012. ↑ Caribbean Investor. December 21, 2004. ACS Welcomes New Executive Board, Directors And New Associate Member. Retrieved December 21, 2007. History of "Turks and Caicos Islands"